is a group of twelve artists that exhibits regularly at the gallery and produce Wednesday happenings as well as group shows like Stuffit at y-1. Their ambition is to present, through different projects, Swedish contemporary art. Swe.de want to contribute to a more extensive sharing between artists and to create a more fun atmosphere to work in. The group is currently working with a exhibition tour produced by Riksutställningar and the first opening will be at Uppsala Konstmuseum in april 2000. More info and tour schedule can be found on Riksutställningars home page. Johanna Billing, Markus Degerman, Ingrid Eriksson, Peter Geschwind, Carina Gunnars, Erla Haraldsdóttir, Karin Johnson, Anna Kindgren, Gunilla Klingberg, Bo Melin, Bella Rune and Christine Ödlund. 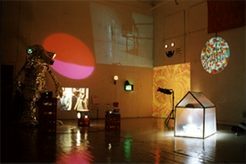 In April -99 Swe.de made the group exhitition "Lightshow" at Signal Gallery, Malmo. Most Wednesdays since August 1997 an artist is invited to do a project in the café area of Y-1. The "wednesday projects" provide a quick way of exhibiting work and gives the audience an overview of what's going on in young swedish art at the moment. 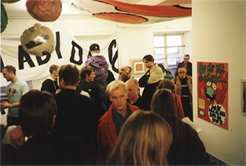 In May 1998 swe.de invited over a hundred artists to participate in a group exhibition. All had had some previous contact with the gallery during the last years. The artists hung their own work until the gallery was stuffed. More pictures and the participating artists listed. Click on the names for CV!